▲ Opponents of the proposed Biyangdo cable car system fear it will not only mar the scenery of the island, as shown in a artist’s impression at right, but that it will have a significant impact on the surrounding enviornment. Photos by Gonn Gi Gab, above, courtesy JejuSori, right. 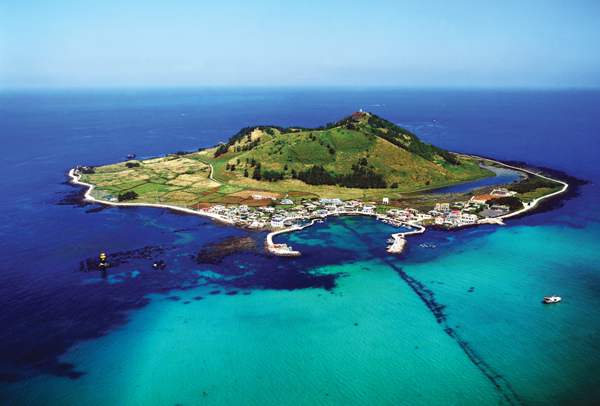 Anyone arriving on Jeju with a business mind can take one look at the island and see dollar signs and opportunity. Only a portion of the island’s beautiful beaches are lined with resorts, the remainder left unsullied to display their natural beauty. Development company Raon Land has advanced many prom-ising ventures, including Raon Golf Resort, Raon Horseriding Club and Raon Mapark (horse-park) - all recent additions to the island’s tourism offerings. Online news portal JejuSori reported in November that Raon, in October, submitted a proposal to the Jeju provincial government for approval to proceed with plans to construct cable car systems. The constructed cars would connect Hyeopjae and Biyangdo, and there are talks of later routes on Halla Mountain as well. How-ever the focus of the proposal is on the western portion of the island at present. Kim said Raon is failing to see how drastic the environmental impact of a cable car system will be on the tiny island of Biyangdo. Currently, he said, the island is home to approx-imately 100 residents and hosts even fewer visitors on a daily basis. With the construction of the cable car system, Kim said more than 20 times that amount of visitors are anticipated, or about 600,000 visitors each year. Kim said the island is simply too small to accom-modate so many people and that the proposed construction site would affect the local pine forest, lava tubes and coastal region significantly. There are also many rare plant species on the Biyang Oreum that he said would be endangered. In January 2008, Olive Press, an English-language news-paper in Spain, reported that a proposed cable car construction between Granada and the Sierra Nevada Mountain range in Spain had been indefinitely shelved due to serious environmental threats. World Heritage group UNESCO backed regional government findings that the construction would pose significant threats to the area’s birdlife, specifically the imperial eagle and the peregrine falcon. The cable car construction will require four poles of 50 meters in height, two of which would be erected on land and two in the water. The construction would bring more than just tourists to the island, he said. Raon’s October proposal was submitted along with a required preliminary review on environmental impact. As a next step, Raon Land is set to submit its final review on the environ-mental impact on Biyangdo by the end of this year. JejuSori reported that once the proposal is approved, Raon Land plans to complete construction of the 1952-meterlong cable car system by May 2010. Currently, the Jeju provincial government is reviewing whether to approve the controversial proposal. The government also declined to discuss the project for this article. Moores and others remain concerned about the impact such a system could have on Biyangdo, and Jeju in general. “Cable cars are usually designed and built to increase the number of people able to visit otherwise relatively inaccessible areas; the larger the number of people - the greater the disturbance to sensitive areas and species,” Moores said.